‘Triangle UFO’ Seen In NASA Apollo 17 Moon Landing Photo — Same Object Spotted In Lunar Module Film? An online UFO hunter has discovered a bizarre image in a NASA photo taken 43 years ago by Apollo 17, the final manned mission to the moon. The 1972 image from the lunar surface, according to the online UFO site Disclose.tv, appears to show three mysterious lights than when examined closely appear to be a “triangle” UFO hovering in the distance. And in an even stranger twist, the “discovery” is not the first time a so-called triangle UFO has been spotted in an Apollo 17 image. In fact, last year, another UFO researcher noticed what he said was a pattern of three rotating lights flying across a moving image taken on 16mm film from the Apollo lunar landing module. The earlier video can be viewed above. Posted last November by Look Now TV, “In this NASA video you’ll see the rotating UFO spinning across screen from right to left, it appears to be another object people have missed over the many years,” according to the group’s YouTube page. 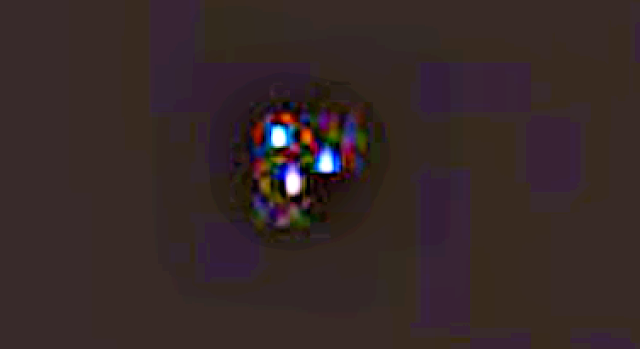 Could the object in the video — assuming it is real and not an optical illusion of imperfection in the film — be the same as the source of the three-light pattern spotted with some difficulty in the following NASA photo, also snapped during man’s last walk on the moon, on either December 12 or December 13 of 1972? The triangle light pattern is difficult to spot in the original NASA photo, which may explain why it went 43 years without being discovered. Disclose.tv highlighted the image to make the appearance of the “triangle UFO” more evident. “In it is alien tech at its finest. Watching the Apollo 17 astronauts on the moon was this TR3B-like craft. However this craft doesn’t have a larger center glowing orb, which the TR3B has,” Waring wrote. The TR-3B, also called the “Black Manta,” is rumored to be a top-secret stealth aircraft developed by the United States Air Force. According to some of the theories surrounding the mysterious and possibly non-existent aircraft, the TR-3B possesses anti-gravity technology and can also be used as a spacecraft. Waring also compared the “triangle UFO” in the NASA Apollo 17 image to descriptions of “alien technology” conveyed by Bob Lazar, who claimed to be a former employee at the government’s secret Area 51 military base and who has alleged that captured UFOs are stored and studied there. The online UFO group also repeats the popular conspiracy theory which holds that Apollo 17 was not, in fact, the final NASA manned mission to the moon — that somehow, the space agency managed to pull off at least one and possibly as many as three subsequent Apollo missions — Apollo 18, 19 and 20 — in total secrecy. Those alleged secret missions, UFO researchers believe, may have had the purpose of making contact with the aliens piloting UFOs such as the one supposedly seen in the Apollo 17 image.